The full frame, with parts attached. 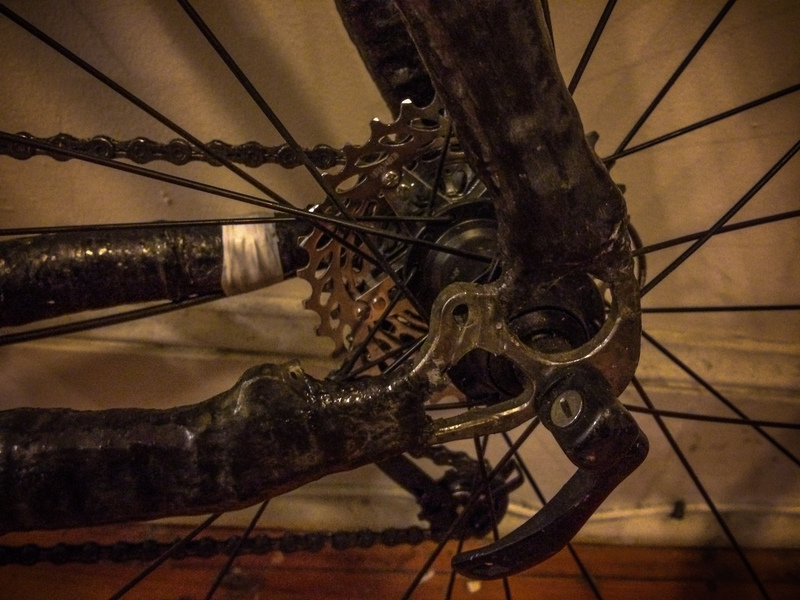 And since so many ask me to clarify, I did not make the fork, wheels, or other components. Those I bought separately. This post, combining this project with my other failed experiment, is 8+ years in the making. 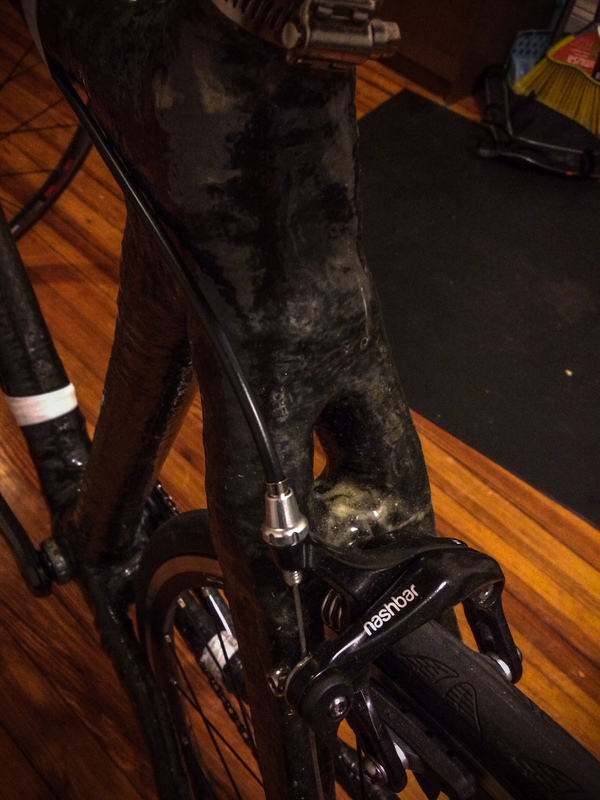 In March, I posted progress I had made on building a carbon fiber bike frame that I was building from scratch using epoxy resin and raw carbon fiber fabric. This is the short and sweet conclusion to that post. The bike is finished, and it works. It is a step for me to say that outright, because I feel in some way that it still might tempt fate to do so. I’m not superstitious, but I am a little -stitious. Last post, I left off at the point where I was ready to start reinforcing the lugs with layers of carbon fiber. Since the rough fiberglass used to do an initial bonding together wasn’t particularly exact, it was impractical to 3d print moulds for the lugs, as I had originally planned. So I proceeded to use tons of electrical tape to wrap the newly-laid layers of carbon fiber fabric. Unfortunately, this is where I stopped taking pictures. There will be a big leap from the end of the last post to this one. The seatstay. This is the most complicated shape I made with my moulds. The cross piece holding the brake was inspired loosely by this square profile seatstay. Turned out great!. I probably wrapped each lug 3-5 times (more than one layer of CF per wrap), and all told probably used 5-6 rolls of electrical tape wrapping and compressing. I don’t really recommend this method, although it turned out alright. I’m currently thinking of ways to get around it. Wrapping like this requires wetting each individual piece of carbon fiber with epoxy. This wastes epoxy, and takes time. After awhile, I just got bored of repeatedly wrapping lugs like this. It’s also heavy. 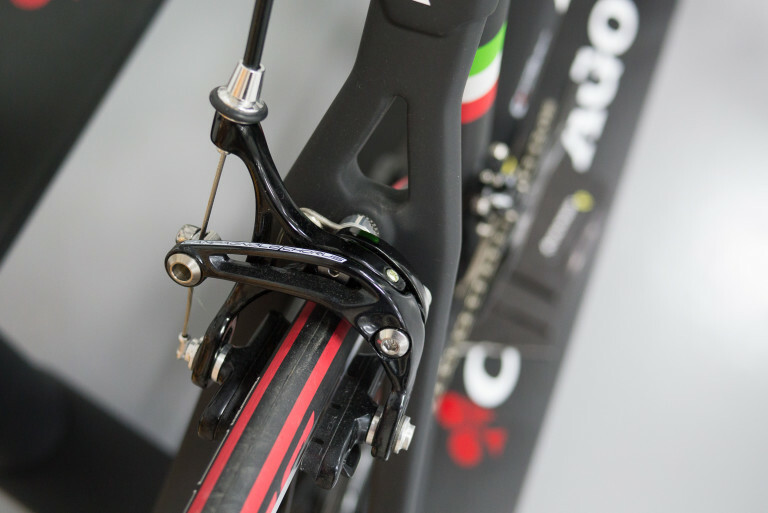 The headtube. Probably takes the most stress, and is where my last bike broke. Still intact. After a few wraps, I set aside the project for a few months. I was distracted during this time with planning for a bikepacking trip to Morocco and studying for my GREs. I was 95% of the way to completion, but just with a few concerns in my head about how to finish various pieces. I was dealing with some very final design issues, chief among them how to attach a saddle (too small of a post for the seat tube). I also still needed to drop some money on a few final components. In July, I picked it up again, threw on one or two more layers of carbon fiber, and built up the final bike. One dropout. If there’s a place where I got sloppy and could improve a lot, it’s here. It’s just very bumpy. I love the way it looks. It’s not the lightest thing in the world, but the 3D printed mould idea worked incredibly, incredibly well after I spent weeks refining my moulding and CAD drawing technique. It’s a little rough around the edges, with some surfaces pretty uneven. A result of the electrical tape not compressing the fiber uniformly. Were there things I’d do differently? Obviously. I’m exploring ways to improve the design. Starting with using even more 3d-printing, for example, to construct more complex pieces. Moulds for the lugs, to replace the really messy and generally wasteful electrical tape. New shapes and geometries. More exactness and precision. The possibilities are endless. Maybe one day I’ll actually trust my process enough to make one for someone else.